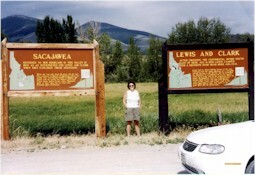 This summer my family traveled part of the Lewis & Clark trail while driving through Idaho. We took the Lemhi Pass over the Continental Divide en route to our bed and breakfast inn. The literature from the Three Forks Chamber of Commerce, bravely described the road as "gravel access on unimproved road." Undaunted, with a full tank of gas and plenty of water and snacks on hand, we pretended to be pioneer adventurers in our cramped rental car. After initially missing the tiny sign for the Lemhi turnoff, we encountered an unpaved road in which the car kicked up clouds of dirt behind us. We were amazed at the isolation of the ranches, and wondered how often plows came in the winter. We also were in awe of the fact that stagecoaches used to navigate the narrow steep hill near the Idaho/Montana border, and soberly noted from a sign that they didn’t always succeed. To the exasperation of certain family members, I insisted on stopping at every historic site marker for a photo, and indeed they were quite interesting. At the top of the pass, we came across a marker for Sacajawea, the expedition’s guide. Heading back to civilization, we saw battle sites and other points of interest. We felt fortunate to have experienced the 200th anniversary of the Lewis and Clark expedition.